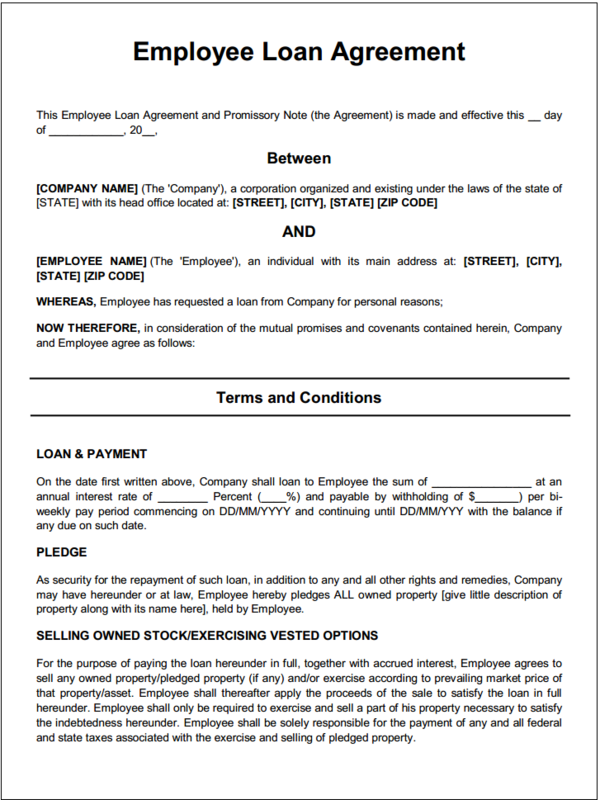 The following is an Employee Loan Agreement, this is used when an Employee wants to take a loan from the company he is working in. The loan can be for personal or professional reasons. The agreement outlines that this template acts as both a loan agreement as well as a Promissory Note. You need to read and understand all of these points before signing this agreement. The effective date of the agreement stating when the agreement will start. The name of your company from which you are going to borrow the loan, along with its registered address. The name of the employee who is requesting the loan, along with his/her address. The company will loan to the employee the money on the date when this agreement is made effective, at an interest rate of specific percentage and the repayment schedule. The employee will have to pledge all property held by the employee as security for the repayment of the loan. To repay the loan, the employee has agreed to sell any owned property / pledged property and/or owned stock. The employee needs to do this only in case he/she cannot repay the loan or the accrued interest. The last point is the promissory note which says; that for the amount received by the employee, he/she promises to pay the company the principal sum along with the accrued interest, on the predetermined date. This agreement is construed and enforced in accordance with the laws of the State in which this agreement is being made. This agreement is legalized after both the employee and a representative of the company sign at the bottom of this agreement. You may modify and amend this agreement format to meet your requirements, click on the link below to download this Employee Loan Agreement. Copyright © 2019 PrintableAgreements.com. All Rights Reserved.